National Drive Electric Week in Las Vegas was staged at the Springs Preserve museum parking lot on Saturday, September 9th from 10 AM to 2 PM under a photovoltaic solar canopy that tracked the sun during the day and provided power to two ChargePoint stations, each with two SAE J1772 AC Level 2 ports. Local supporting organizations included the Nevada Electric Vehicle Accelerator program from REA250.org, Las Vegas Electric Vehicle Association, Sierra Club Toiyabe Chapter, Clean Energy Project, Citizens Climate Lobby, SolarNV, NV Energy, Green Alliance of Nevada, Las Vegas Tesla Owners, Verdek, and ChargePoint. An electric car rally featured about 40 plug-in hybrid electric vehicles and battery-powered electric vehicles from worldwide automotive manufacturers, including Tesla Roadster, Tesla Model S, Tesla Model X, Nissan LEAF, GM Chevrolet Volt, GM Chevrolet Spark EV, Ford Fusion Energi, Ford Focus EV, Fiat 500e, Daimler Smart ED, BMW i3, and Mitsubishi i-MiEV. 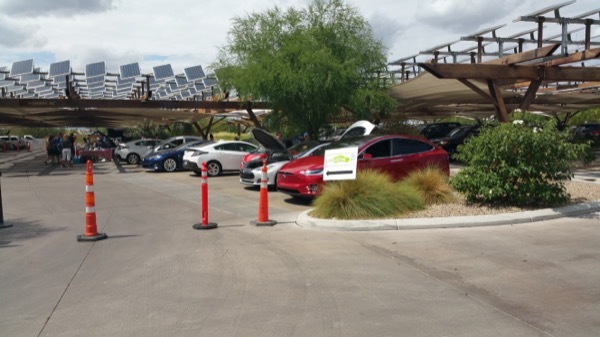 National Drive Electric Week in Las Vegas will be staged at the Springs Preserve museum parking lot on Saturday, September 9th from 10 AM to 2 PM under a photovoltaic solar canopy that tracks the sun during the day and provides power to two ChargePoint stations, each with two SAE J1772 AC Level 2 ports. Sponsoring organizations include Las Vegas Electric Vehicle Association, Sierra Club Toiyabe Chapter, Clean Energy Project, SolarNV, NV Energy, Nevada Electric Vehicle Accelerator, Green Alliance of Nevada, Las Vegas Tesla Owners, Verdek, and ChargePoint. An electric car rally will feature plug-in hybrid electric vehicles and battery-powered electric vehicles from worldwide automotive manufacturers, as well as EV conversion cars and other innovative electron-powered vehicles. Informational booths will provide educational outreach about electric vehicle technologies and EV infrastructure available within Nevada. Refreshments and drinks will be available. Discount tickets to the Springs Preserve exhibits and facilities will also be available during the day of the event. Come bring the family and join the fun! Registered attendees report 988,690 electric miles driven.